Rare Coast-to-Coast Total Solar Eclipse Thrills Millions Across U.S. The total solar eclipse of Aug. 21, 2017, as seen from Carbondale, Illinois. A layer of cloud partially covered the eclipse for some in the town. CARBONDALE, Ill. — The moon's dark shadow swept across the United States in a total solar eclipse today, thrilling millions of spectators with a Great American Solar Eclipse, from sea to shining sea. The eclipse Monday (Aug. 21) was the first in nearly a century to cast the moon's shadow on the entire contiguous United States (the last one was in 1918). The moon's shadow crossed 14 states, from Oregon to South Carolina, along a path that is home to 12.2 million people, NASA officials said. Another 200 million Americans were within a day's drive of totality, with tourists also flying in from other states and countries. The question on everyone's mind was the weather, no more so than here, where more than 50,000 people were expected to pack this college town (population 30,000) to witness the event. Southern Illinois University postponed classes (today was originally the first day of school) and sold out its 15,000-seat Saluki Stadium to eclipse chasers hoping to experience 2 minutes and 38 seconds of darkness as the moon's shadow crossed the country. The day was not without drama. Twenty minutes before totality, a huge cloud passed over the partially eclipsed sun, threatening to block views of the main event. 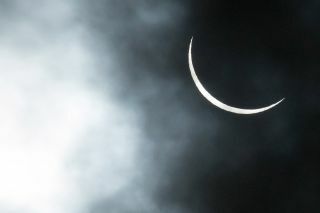 As the time of totality — 1:20 p.m. CDT (2:20 p.m. EDT; 1820 GMT) — approached, spectactors broke out in chants of "No clouds!" and "Move That Cloud!" And just as totality occured, a break in the clouds let the eclipse burst through. The crowd went wild. Mayo said he saw totality "for about 10 wonderful seconds" before the clouds rolled back in. On the stadium's field, elated scientists reported a magnificent observation of the "diamond ring effect" — the brief flashes before and after totality that give the sun a ring-like look. "We saw the diamond ring at the start, we saw the diamond ring at the end," said Bob Baer, co-chairman of SIU's eclipse-planning team. "Those are the two best parts! The diamond rings were awesome!" Solar eclipses occur when the moon passes exactly between the Earth and sun, covering the entire face of the star for a few brief minutes before the moon continues along its monthly orbit around our planet. When that cosmic alignment occurs, a wonder of nature befalls the Earth. During a total solar eclipse, day turns to night. Stars and planets (Mercury, Venus, Mars and Jupiter in today's case) become visible, the temperature drops, animals can get confused and act strangely and eclipse chasers experience an unmistakably profound experience. "There is nothing that was going to make me miss this," eclipse-chaser Jennifer Ehrich of Houston told Space.com in the days leading up to today's eclipse. For Ehrich, today was special for another reason: It's her 44th birthday. Ehrlich, a geologist, had been waiting for this eclipse for 25 years, ever since she discovered it would occur on her birthday while studying astronomy in 1992 as a student at the University of Iowa. She traveled with her husband, Andy, and 10-year-old daughter, Miranda (who is missing school for the eclipse), to witness the eclipse from a rest stop along Interstate 55 north of Bloomsdale, Missouri, about 71 miles (114 kilometers) west of Carbondale. "This, for me, seems like the most magnificent natural phenomena that anyone could ever see," Ehrlich said. Photographer Tom Seaton, 52, of Sun Prairie, Wisconsin, made the trek to Carbondale looking forward to seeing totality for the first time after a camera mishap in 1979 — when the last total solar eclipse was visible from the U.S. mainland — prevented him from seeing the sight. He was 14 years old at the time and has been waiting 38 years for another change. "I am on a 38-year quest," said Seaton, who is photographing the eclipse for the Google/UC Berkley Eclipse Megamovie project. "I'm here now, and I'm waiting for this to happen!" "And when was the last time like 10 million people in the United States ever agreed on the same thing? Like, this is cool!" Seaton said. Some younger spectactors traveled to SIU with their schools to observe the eclipse. Among them was sixth grader Michael Gomez, 12, of Decatur, Illinois. Gomez was one of 100 students from the French STEM Academy who took a bus to Carbondale for today's eclipse. "It was just so weird having the moon cross the sun and having it all be together," Gomez said. "It was a really great experience for me, and I hope in a few years I'll get to experience it again." "This eclipse is very special for us as Americans," Mike Kentrianakis, project manager for the American Astronomical Society's (AAS) Solar Eclipse Task Force, who saw his 11th total solar eclipse today, told reporters yesterday. "This is grand in that it's available to almost anyone within driving distance, from coast to coast." For Kentrianakis, the eclipse brought a bonus. After 38 years chasing eclipses around the world, it was his first total solar eclipse in the United States. "This is a real celestial event in real time, where you can actually watch it," Kentrianakis said. "You're going to take a breath and realize that you're part of space, part of our solar system and beyond." Anticipation for the solar eclipse reached a fever pitch in the days leading up to the big event. NASA and the AAS repeatedly issued warnings for safe solar viewings throughout the summer. The U.S. Department of Transportation issued traffic warnings and guidelines for states within totality. NOAA and the National Weather Service created a special weather-tracking website so eclipse chasers could track cloud-cover forecasts. From start to finish, today's solar eclipse was expected to last 4 hours, making landfall at 9:05 a.m. PDT (12:05 p.m./1605 GMT) in Lincoln City, Oregon, and leaving U.S. soil in Charleston, South Carolina, at 4:09 p.m. EDT (2009 GMT). The moon's dark shadow streaked across the United States at speeds of between 3,000 mph (in western Oregon) and 1,500 mph (Charleston), according to NASA. "We live in an amazing time where we're learning new things about the universe almost daily," Mayo, the planetary scientist with NASA, said yesterday. "But one of the things that we still don't know about is how the sun operates." The sun's outer atmosphere, called the corona, is a cosmic mystery. It is there that the sun's temperature jumps from thousands of degrees into the millions via a process scientists don't fully understand, Mayo said. A better idea of how the corona works could reveal insights into the sun's weather, like solar flares and storms that can impact satellite navigation and other technology we use on Earth every day, to aid future forecasts. During the few minutes of totality in a total solar eclipse, the sun's corona becomes visible, giving scientists a brief chance to take measurements. NASA teamed up with astronomers and citizen scientists across the country to observe the sun's inner corona for as much of the 90 minutes the moon's shadow passes over the U.S. as possible. More than 50 NASA-funded research balloons were launched to observe the eclipse from above the clouds. NASA is watching from the ground, air and space with 11 different spacecraft, astronauts on the International Space Station and chase planes. Along the path, 68 telescope sites were set up under Citizen CATE (Continental-America Telescopic Eclipse), a collaboration of scientists, students and volunteers all using identical equipment to measure the inner corona. But the timing of her observations must be exact, and this is her first total solar eclipse. She and her team spent weeks practicing to make sure they take their data, while also experiencing the eclipse. "You only get one shot at the whole thing," Yanamandra-Fisher told Space.com. "It's not something you can rewind and replay." Here in Carbondale, the solar eclipse has an extra twist. On April 8, 2024, another total solar eclipse will pass over the town. "Not only does Carbondale get an eclipse, they also get the longest eclipse along the path and they get another eclipse," Kentrianakis said. "So it's like a triple jackpot." Bob Baer, a co-investigator on the Citizen CATE project, helped lead the charge in planning the university's eclipse coverage. Planning began in 2014, with SIU teaming up with NASA, Chicago's Adler Planetarium and the National Solar Observatory to make the event happen. Involving students and volunteers, he said, was a vital part of that preparation in order to inspire a new generation in the sciences, he added. "I think you're going to be hearing a lot about citizen science," Baer said. But the lesson doesn't end there. After all, the next eclipse is just seven years away. "We're taking what we learn from this," Baer said. "There is a lot of debriefing to do, I think for maybe six months into 2018, to use what we learned here." This story was updated at 6:11 p.m. EDT with new quotes from eclipse observers. Space.com's Mike Wall contributed to this report from San Francisco. Calla Cofield contributed from Rexburg, Idaho. Hanneke Weitering contributed from Nashville, Tennessee. Sarah Lewin contributed from Bryson City, North Carolina, Doris Salazar contributed from Greenville, South Carolina, and Space.com senior producer Steve Spaleta contributed from New York City.